According to a media meeting organized by Quang Ninh department of tourism and Halong city people's committee, all households living in floating houses around Halong Bay will be removed in June, other news such as relocation schedule of families and houses to new resettlement area on land in order to make the environment clean a beautiful natural wonder of the world. 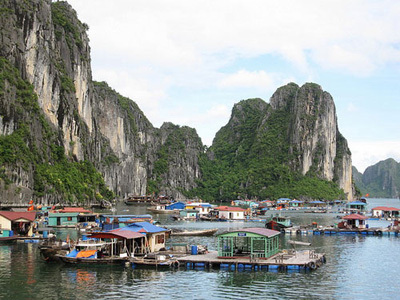 Plan to resettle the households and houses on Halong Bay was approved in 2012. By the end of April 2014 the city people's committee has encouraged 147 households to voluntarily move, forced 5 floating houses to leave, and 325 families among 462 houses will be resettled in the fishing village of Ha Phong commune, 137 households were funded in the new inhabitation. For hundreds of years, the fishermen in Halong lived on the sea, there are villages which has become famous as part of the Halong bay travel sites such as Ba Hang, Cua Van, Vong Vieng, Cong Dam...People live on floating houses, under the houses are fish cages raising seafood to sell to tourists, floating market has become an attractive indispensable part for visitors doing halong bay tours, many beautiful pictures about the floating villages of Halong bay has been taken by travelers. Halong city has so far completed and handed over 364 qualified resettlement apartments in Ha Phong commune's fishing village. The houses are terraced one floor with an area of 77.5 and 128 sq metres. There is also a system of schools, medical care centre to serve the academic and health care for people living on the area.